In July I provided a first look at Project Photofly, an uber-cool technology from Autodesk that lets you build 3D models from photographs. Now I’ll admit it’s difficult to exceed the cool-factor of something like Project Photofly. Still that doesn’t mean Photofly’s slightly less glamorous cousins are any less attractive and/or useful. 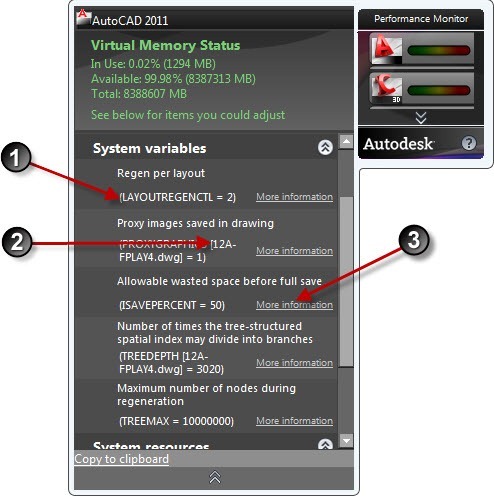 Performance Monitor for AutoCAD; it’s small, lightweight, and very useful Windows Gadget that monitors the virtual memory usage of your AutoCAD based products. Don’t feel bad if that doesn’t sound cool enough to spend (waste) your time downloading and installing; I too nearly skipped past it without ever looking back. At first glance I thought, oh that’s nifty, but was pleasantly surprised after finally downloading and installing. Looking at nothing more than its name, you can probably guess the first requirement – AutoCAD. However there is a pleasant twist to this requirement. 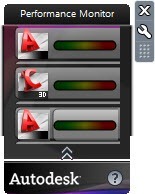 Unlike several past AutoCAD related Autodesk Labs products released, the Performance Monitor Gadget also works with several flavors of AutoCAD. Any version of AutoCAD, AutoCAD Civil 3D, AutoCAD Map 3D, AutoCAD Architecture, or AutoCAD Plant 3D from 2009 – 2011 will work! Being a Windows Gadget the second requirement is well – support for Windows Gadgets. Translated, you must be running Windows Vista or Windows 7 to use Windows Gadgets. It doesn’t matter if you’re running the 32-bit or 64-bit versions of Windows. Being a Windows Gadget, the Performance Monitor will live on your desktop, and in its default form display a graph of the amount of virtual memory your AutoCAD application is using. Something I found quite handy about this is the way it individually lists each AutoCAD session you have running. For example, the following illustration indicates I have two sessions of AutoCAD running, and one session of Civil 3D running; graphing each one independently of the other active sessions. As great as the virtual memory graph is for monitoring the virtual memory of each AutoCAD session is, the real power of this Gadget was realized by clicking onto the graph. Doing this expands the Gadget and displays all sorts of incredibly useful information about the drawings I have opened. System Variable Value: The current values of several system variables that can have a dramatic effect on virtual memory usage are listed. Drawing-Specific Variables: For variables stored with the drawing (and not the AutoCAD session), the drawing name is displayed in brackets after the variable name. More Information Link: If you’re unfamiliar with any of the variables listed, clicking on the More Information link will take you directly to a help document describing that system variable. 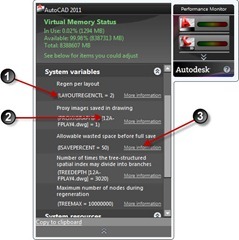 Aside from simply monitoring the virtual memory usage of AutoCAD, the Performance Monitor Gadget is a great troubleshooting tool. Use it to compare key system variables between drawings, and quite possibly figure out why that one drawing is so slow to open, save, or just look at.